Oxford, Maine - Buckfield's TJ Brackett nailed down his second Budweiser Championship Series Super Late Model win of the season in Saturday night's 50-lap Super Late Model race at Oxford Plains Speedway. Brackett, a two-time champion of the top class at OPS, battled hard for the victory against Auburn's Travis Stearns, in Stearns best run since moving into the Super Late Model division after a very successful run in Late Models. Even after yielding the race lead to Brackett, Stearns was a threat to win, racing hard and even with the eventual winner in the outside groove for several laps on cold tires. In the end Brackett won by 1.04-seconds over Stearns. Rhode Island native Kyle DeSouza, now living in South Carolina, made a rare OPS start pay off with a third-place finish. Buckfield's Kyle Treadwell fought his way to a fourth-place finish, with Super Late Model rookie Ryan Robbins of Dixfield rounding out the top five. The previous week's winner, four-time and reigning track champion Timmy Brackett of Buckfield just missed out on a top-five finish. It was a good night both inside and outside of the cockpit for winner TJ Brackett, whose shop often hosts the cars that finished third, fourth and sixth. Dennis Spencer, Jr. of Oxford ended up in seventh position. Current championship points leader Alan Tardiff of Lyman was eighth, just in front of his closest championship rival, Andy Saunders of Ellsworth. Gabe Brown of Center Conway, New Hampshire started at the back of the pack and finished tenth in his first Super Late Model race. 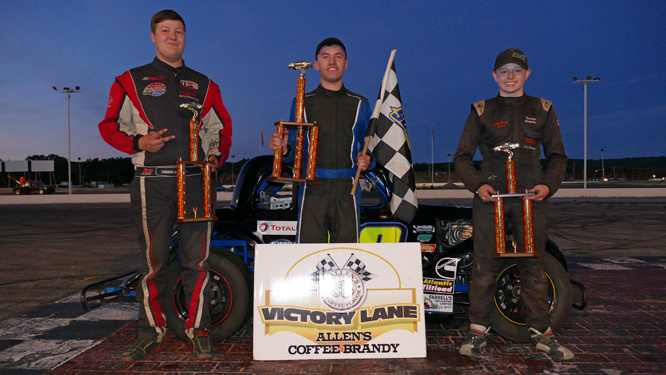 Bryce Mains of Bridgton made the best season of his racing career a bit sweeter, winning the 30-lap Allen's Coffee Flavored Brandy Street Stock race by a comfortable margin. 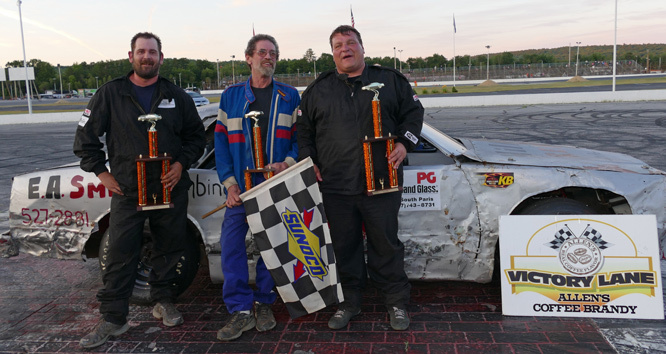 It was the sixth win of the season for Mains between the weekly racing series events and the special Street Stock Quad Series races, two of which are at Scarborough's Beech Ridge Motor Speedway. Mains took the lead away from Matt Dufault of Turner, who led the first ten laps and ran in second position until limping to a fifth-place finish when something broke with only a couple of laps to go. Livermore's Tyler King made a late charge into second position, with points leader Billy Childs, Jr. of Leeds claiming third-place honors. David Whittier of Poland was fourth under the checkered flag. Mains won the heat race. Richard Kimball of Mechanic Falls raced to a career-first OPS Budweiser Championship Series victory in the 20-lap main event for the Bandits division. Kimball quickly moved up through traffic to take a lead he would not relinquish in the 28-car, non-stop caution-free race. Chad 'Joe Dirt' Wills of Oxford outgunned Kyle Hewins Motorsports teammate Adam 'Larry Bandito' Sanborn of West Paris for runner-up honors. Last year's champion, Jamie Heath of Waterford, raced from the back of the pack to finish fourth without the benefit of a caution flag. Travis 'Tornado' Verrill of South Paris raced to a top-five finish in the Bandit division's main event. Verrill and Eric Stoddard of South Paris won heat races in the Bandit class. Legendary Oxford Plains Speedway Figure 8 racer David Smith of South Paris claimed victory in a wild 15-lap Figure 8 race. Just about everyone else suffered through one problem or another, with Tommy Tompkins posting a runner-up finish. Kyle Kilgore passed a ton of cars, many two or three times, to earn third-place hardware. Eric Hodgkins of Minot and Lisbon's dale Lawrence rounded out the top five. Corey Hall of Jolicure, New Brunswick emerged triumphantly from the 25-lap main event for INEX Legends Cars. New Hampshire invader Thomas Everson of Gilmanton claimed runner-up honors, with the podium filled out by reigning track champion Austin Teras of Windham. Poland's Peter Craig was fourth, followed by Buxton's Colby Meserve. Casey Call of Pembroke, New Hampshire won the heat race and led about half of the feature race before misfortune set in. Pro All Stars Series Super Late Models top a special 5:00 p.m. racing card today (Sunday, July 30) with a 150-lap main event highlighting the racing card. PASS Mods, Legends Cars and Bandits round out the program for the special Sunday racing card. The Budweiser Championship Series at Oxford Plains Speedway resumes on Saturday night August 5 with Super Late Models, Allen's Coffee Flavored Brandy Street Stocks, Bandits, Legends Cars and a Figure 8 race making up that program. For more information please call (207) 539-8865. Unofficial Budweiser Championship Series stock car racing results from Oxford Plains Speedway; Oxford, Maine; Saturday, July 29, 2017 showing finishing position, car number, driver's name, driver's hometown. Super Late Model (50 laps) 1 61 TJ Brackett, Buckfield; 2 16 Travis Stearns, Auburn; 3 10 Kyle DeSouza, East Providence, RI; 4 44 Kyle Treadwell, Buckfield; 5 36 Ryan Robbins, Dixfield; 6 60 Tim Brackett, Buckfield; 7 46 Dennis Spencer, Jr., Oxford; 8 9 Alan Tardif, Lyman; 9 01 Andy Saunders, Ellsworth; 10 47 Gabe Brown, Center Conway, NH; 11 53 Alan Wilson, Hebron; 12 8 Calvin Rose, Jr., Turner; 13 21 Shane Clark, Winterport; 14 52 Bruce Haley, Minot; 15 54 Ryan Deane, Winterport; 16 72 Scott Robbins, Dixfield; 17 9 JT Thurlow, Windham; 18 47 Kelly Moore, Scarborough; 19 03 Scott Moore, Anson; DNS 2 Chad Dow, Pittsfield. 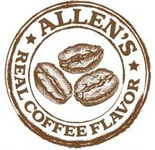 Allen's Coffee Flavored Brandy Street Stock (30 laps) 1 77 Bryce Mains, Bridgton; 2 11 Tyler King, Livermore; 3 1 Billy Childs, Jr., Leeds; 4 58 David Whittier, West Poland; 5 61 Matt Dufault, Turner; 6 36 Richard Spaulding, Lisbon; 7 33 Andrew Breton, Greene; 8 39 Drew Morse, Buxton; 9 27 Patrick Thorne, Standish; 10 35 Christina Nadeau, Buxton. Bandits (20 laps) 1 21 Richard Kimball, Mechanic Falls; 2 52 Chad Wills, Oxford; 3 51 Adam Sanborn, West Paris; 4 91 Jamie Heath, Waterford; 5 24 Travis Verrill, South Paris; 6 26 Tyler Green, Turner; 7 77 Rob Crepeau, Minot; 8 56 Addie McDaniel, Bridgton; 9 53 Dustin Salley, Poland; 10 1 Brandon Varney, Auburn; 11 3 Chachy Hall, Oxford; 12 2 Shaun Hinkley, Oxford; 13 95 Eric Stoddard, South Paris; 14 36 Scott Jordan, Auburn; 15 5 Jacob Hall, Oxford; 16 04 Tyler Jalbert, Auburn; 17 71 Chris Foster, Lisbon; 18 44 Tyler Libby, Auburn; 19 81 Chris Ouellette, Milan, NH; 20 18 Brian Hiscock, Turner; 21 49 Jacob Dobson, Hartford; 22 4 Dave Brennan, Winthrop; 23 79 Kyle Metivier, Lisbon; 24 33 Matt Hiscock, Turner; 25 55 Dean Jordan, Jay; 26 23 Eric Parlin, Mechanic Falls; 27 93 Justin Spear, Wiscasset; 28 00 Larry Lizotte, Poland. Figure 8 (15 laps) 1 54 David Smith, South Paris; 2 113 Tommy Tompkins, Carthage; 3 4 Kyle Kilgore, South Paris; 4 97 Eric Hodgkins, Minot; 5 2 Dale Lawrence, Lisbon; 6 07 Kyle Glover, Oxford; 7 40 Robert Morey, Lisbon; 8 41 Greg Durgin, South Paris. Legends Cars (25 laps) 1 08 Corey Hall, Jolicure, New Brunswick, Canada; 2 4 Thomas Everson, Gilmanton, NH; 3 29 Austin Teras, Windham; 4 4 Peter Craig, Poland; 5 92 Colby Meserve, Buxton; 6 27 Luke Lebrun, Newton, MA; 7 71 Mike Currier, Eats Wakefield, NH; 8 90 Casey Call, Pembroke, NH; 9 14 Aliyah Neale, South Royalston, MA; 10 29x Kevin Oliver, Gray; 11 129 Colby Benjamin, Belmont.